Some days just get away from me. This past year feels like a string of those days. It was a year ago that my life was about to be thrown in turmoil, and I would play catch up, until now. Now, I finally feel like I have some agency back. It feels good. I was not sure I would be able to get this post out tonight. So much has happened in the last few days, my head is swimming. But, it is all good stuff. Things falling away that I do not need, and things coming together for something new. Like a beautiful homemade stock. There is quite a bit of frenetic activity to bring all the ingredients to the moment they are before you, then there is a long simmer, and then there is a beautiful and rich base. 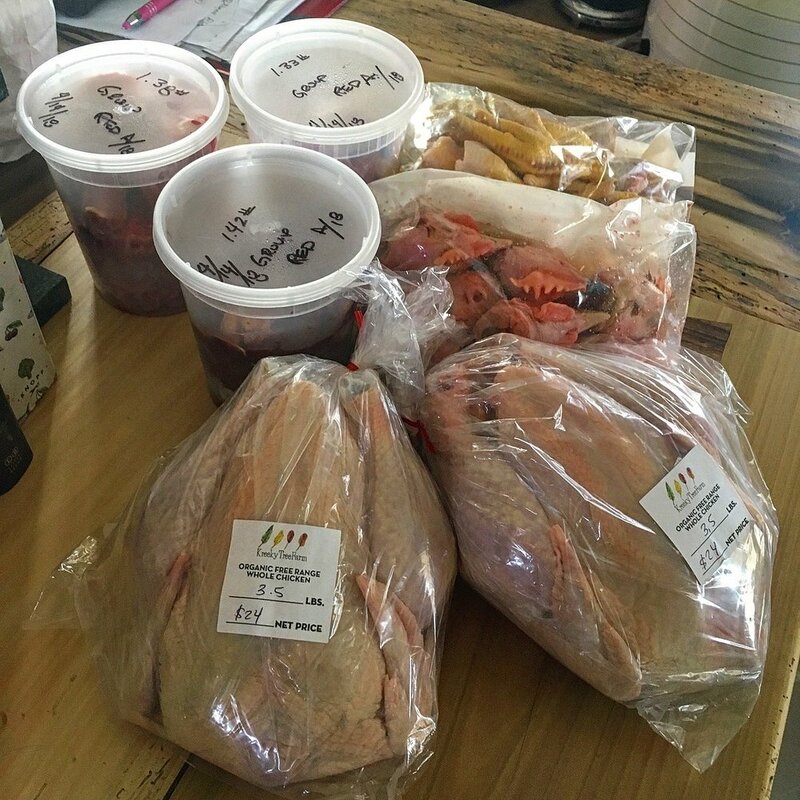 The Traditional Chicken Stock, the Everyday Chicken Stock, and the Vegetable Stock are from Michael Ruhlman's Ratio . If you do not yet own this book, go out and get it from your local bookstore. I present the basics of his recipes, but you should read his writing on stocks. As he states, "Stock is important. ", and when you read the chapter, you fully understand why. You can find my recipe for Decadent Roast Chicken here . It makes a jus and seasoned carcass that make a wonderful Everyday Chicken Stock. Nobody's chicken is finer than Kreeky Tree Farm chicken. I will never forget the first time I prepared and ate one of Allan's chickens. I tasted chicken for the first time. The Scrap Stock is mine. It is a wonderful way to use veg scrap. You reduce your waste, and you enrich your future cooking. I put everything into bags in the freezer, including potato and apple peels. It all works. Reduce heat to low, or place in a pre-heated oven to 180-190F. Cook for 4 hours. Add remaining ingredients, they will cool the stock, so place on high heat to bring it back up to just below simmer. Cook at 180F for an additional hour. Strain the stock, then pass through cheese cloth. Optional: A teaspoon Black Peppercorns, Bay Leaf, Some Parsley Sprigs, Stems of Thyme, a few Garlic Cloves, Leek Tops, if available. Any of these will enhance the finished stock. 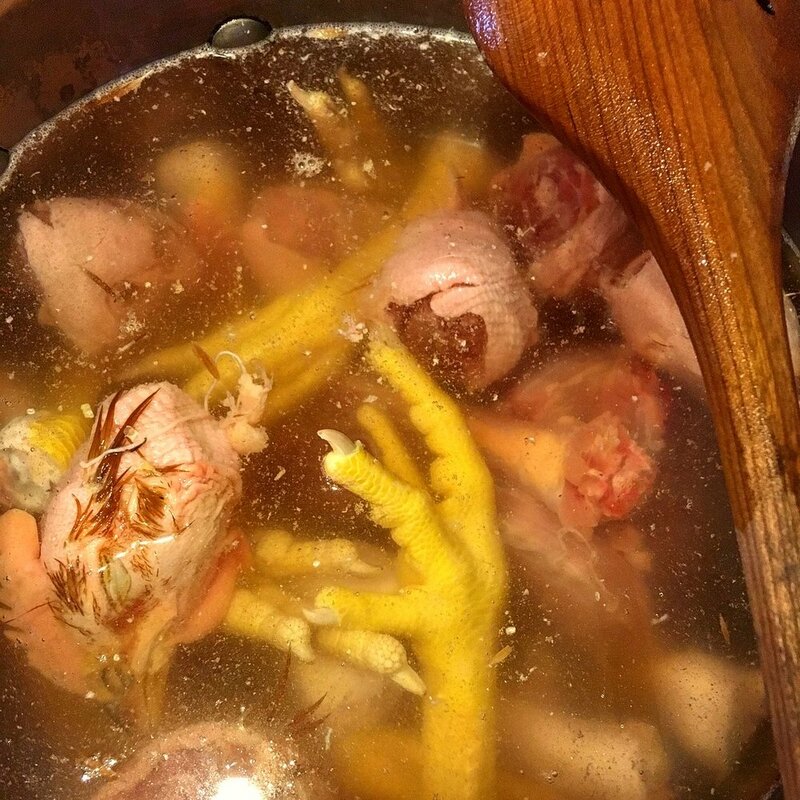 Cut or Pull the Chicken Carcass into pieces so that it fits in a 2 Quart Pot. Cover the bones with cold water. Put on very low heat for 2-6 hours, just enough to keep the water to just below simmer. Or, place in oven pre-heated to 180F. Strain the stock into clean container. Alternatively, begin the stock in evening. Cook for 1-2 hours, turn off heat, and allow to cool on stovetop until the following evening. Add vegetables and cook the stock for 1 hour. Strain into clean container. I do this with almost all stocks made from dinner scraps. Combine all ingredients except salt and bring the water to just below a simmer, about 180F, and cook for 1 hour. Add a small amount of salt, and taste - it should taste lightly seasoned. Pass stock through a strainer, then through cheese cloth. > Sweat veg in a few tablespoons of vegetable oil over medium heat, just until they soften and begin to release moisture, then add water. Add herbs and salt after adding water. Season with salt after straining. > Roast veg or brown them in a hot pan. Add herbs and salt after adding water. Season with salt after straining. 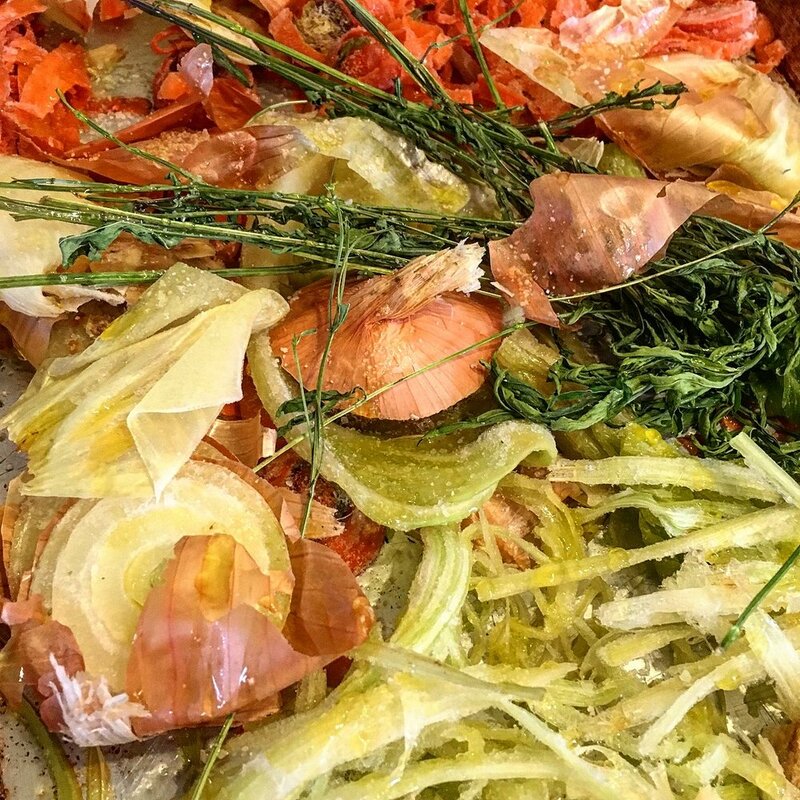 Save vegetable scraps from cooking in the freezer until you have 2 pounds. Place frozen Vegetable Scraps in large bowl and coat with vegetable oil, lightly season with Coarse Salt & Cracked Pepper. Roast in oven pre-heated to 450F for 10-15 minutes. Put roasted veg scrap in pan, add cold water and cook on low heat, just below simmer, for 1 hour. Alternately, place pan in oven pre-heated to 180F and cook for 1 hour. Strain stock, then pass through cheese cloth. That's it! Go and make stock. You will use it in beans, noodles, rice, and even for just a cuppa. I've got veg to prep to finish my Traditional Chicken Stock.